This large Jewelry Armoire is trimmed in cushion, has 8 drawers; it is gorgeous with exceptional storage space. The top has a large mirror and divided storage including multiple ring rolls for even the largest ring collection. The top 2 drawers are divided (4 and 2), and the remaining drawers fully open for bracelets and delicates. The entire interior is fully lined. The sides are luxurious cloth with thick padding and tear resistant. 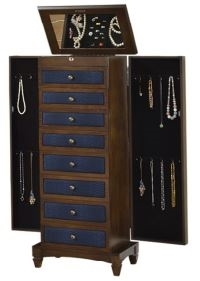 This large jewelry armoire holds large collections of rings, necklaces, earrings, bracelets, scarves, and other accessories. The side necklace cabinets are lined and each side has 8 large necklace hooks. The color is coffee with black felt lining. Measures 19 1/2" wide, 13" deep, and 44 3/4" high. The top locks.